One of the most beautiful view points of the island and a future landmark , the construction of the Phra Puttamingmongkol Akenakkiri Buddha Statue, will be completed later in 2008. The monumental Statue of Lord Buddha is 45 meters high and reachers 25 meters diameter at its base. The Buddha is sitting on a huge podium designed as a lotus flower. 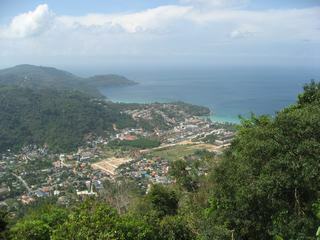 From Nakkerd Hill (Khao Nakkerd) he is looking to the east towards Chalong Bay. The view is enormous and a ride up to the summit of Nakkerd Hill is always worth the trip. The road up to Big Buddha is between Chalong Circle (Ha Yeak Chalong) and Wat (Temple) Chalong. You can’t miss the turn as you see huge signs with “Big Buddha”. This road to the peak is 5.5 km — mixed partially paved and dirt. If you drive up with a motorbike you should keep an eye on the many pot-holes. From the car park you go through a big hall before climbing up another 78 steps. In the big hall you can find information about the building progress, souvenirs, Buddhist amulets and a model of Nakkerd Hill including a little Big Buddha. The magnificent view compensates for the little exercise exerted in getting there and you will enjoy the silence and wonderful view overlooking southern Phuket. 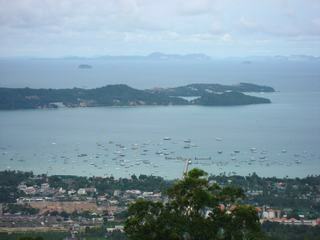 To the east you can see Chalong Bay with its fleet of boats moored there; to the south is Rawai and to the west you have a nice look over Kata Beach. For a donation of 100 Baht you will receive a small marble tile which you can sign with your name and thoughts. 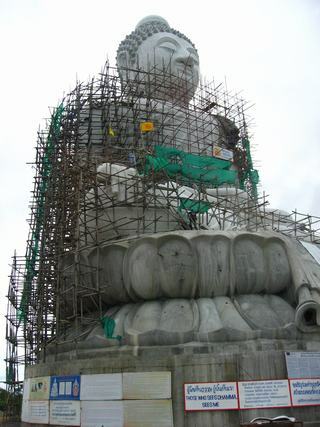 The marble tile will be used to cover the Big Buddha to give him a noble finish.